A lace mesh blouse…thanks to a friend! I mentioned yesterday that my wonderful friend, Sara, donated some of her closet clutter to me. As soon as I opened her newly gifted bag of possibilities, I was intrigued by a small ball of what appeared to be lace mesh. The tags were still attached and as I unwound the lace I realized it was a wonderfully delicate lace, mesh blouse. I recognized the brand also – Rodarte for Target – which appeared a few years ago and I think was quite successful. As I said the tags were still attached and when I inquired as to why she didn’t wear it, she stated she just couldn’t get it to work with the blouses she added underneath it. As I’m always up for a challenge, I decided to make this blouse a priority! I tried 5 or 6 blouses with it until I found the button up Banana Republic shirt you see in my pictures. I just loved the effect…a trendy Victorian high collar complete with bows at the neck and wrists but totally modern due to the sheer fabric! 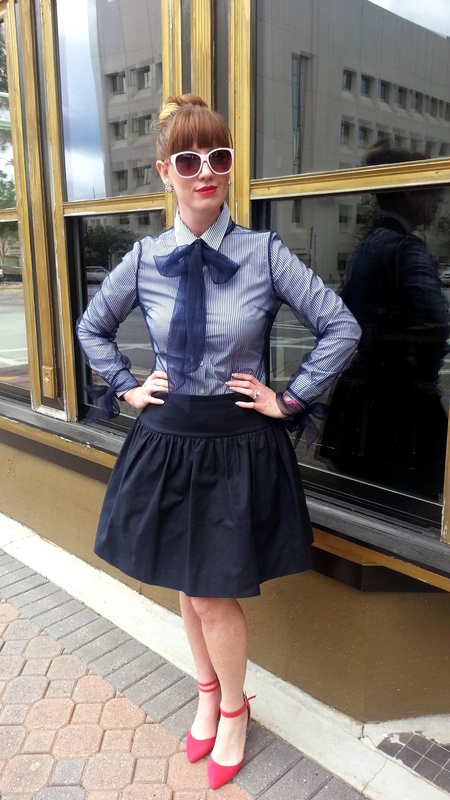 I paired the blouses with a skirt from Sara’s donation gift bag also – a beautiful Tara Jarmon skater skirt she bought while in Paris! Also with tags still attached! Once I added my red ASOS heels, the look was complete! I must say, I’ve enjoyed wearing this outfit today. It has such a structured yet chic look and I love the way I feel in it. I love it! And, what an amazing friend you’ve got there. 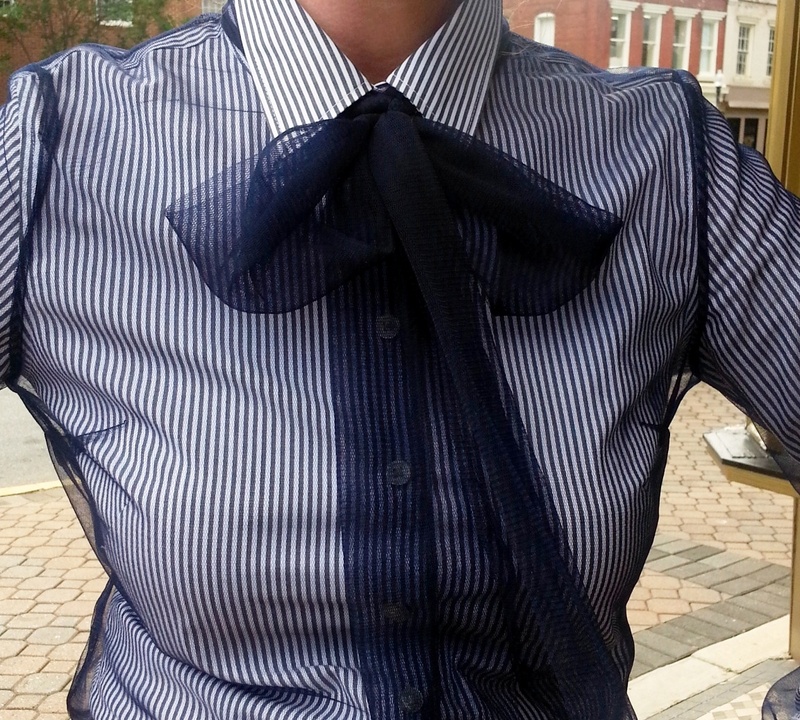 Love the look…I think the blouse is truly unique & you pulled the look off effortlessly. I love that look it such an interesting take on the buttoned up blouse.